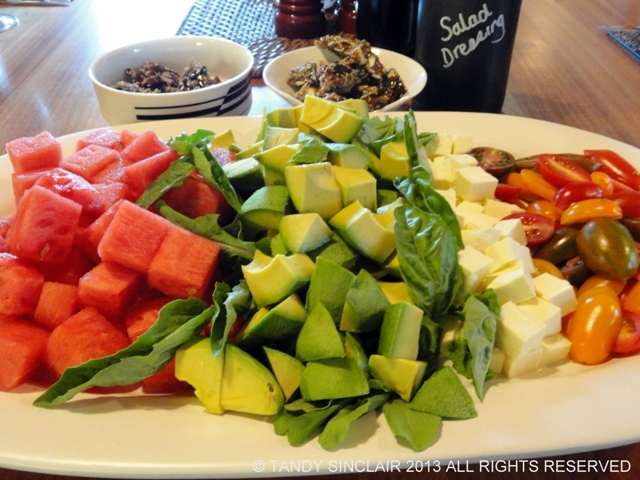 Late last year I participated in Yuppiechef’s annual cookathon and our meal started with a melon and avocado salad with a roasted tomato salad dressing. Tami commented that she was looking forward to the recipe for the salad dressing, and it has taken me quite some time to get it posted. We used up the first bottle of salad dressing over a couple of weeks and then I made my adapted version. I have used it on green salads, with coleslaw and even to top roast vegetables. I roasted a tray of mixed root vegetables and then topped it with the roasted tomato salad dressing. I left the vegetables to cool and this made for a really great salad to accompany our meal. This roasted tomato salad dressing is so versatile I have even used it with quinoa to add a great depth of flavour to a salad. Here I made a plain cucumber, tomato, feta and basil salad and tossed this with the roasted tomato salad dressing. Blog-checking lines: For March’s Daring Cooks’ Challenge, Ruth, Shelley and Sawsan asked us to totally veg out! We made salads and dressings, letting the sky be the limit as we created new flavors and combinations that reflect our own unique tastes. this is such a great dressing! i bet it’s full of flavors and simple to make! A creative colourful good-for-you salad with a superb alternative dressing! Gorgeous – bet it had a wonderful flavour! 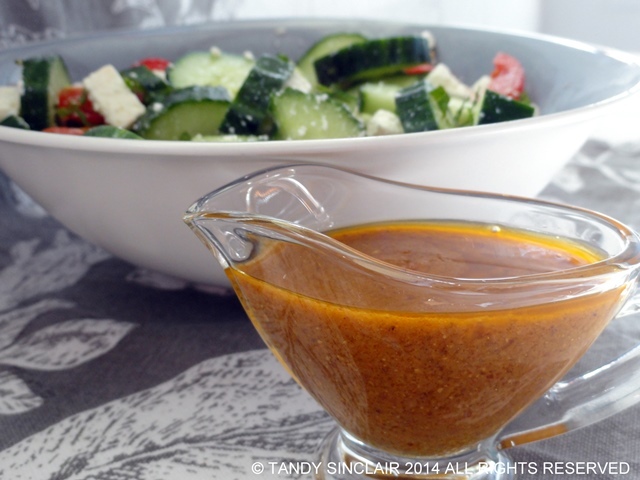 You always have the best salad dressing recipes! I bet this would also taste good in a pasta salad, what do you think? This salad dressing looks so versatile! Yum! I have masses of lovely ripe, organic tomatoes to use up at the moment as it’s peak growing season.Great idea. And the colour is vibrant and inviting! YUM! Love this recipe. I cannot eat dressings that aren’t home prepared and this one has favorite flavors. What a great salad dressing, I don’t think I have had anything like this. I just adore everything about this. Thanks for sharing! The salad dressing is great! Sounds like a scrumptious dressing Tandy. Thank you Mandy, hope you had an amazing weekend!